In the early 1990s, HarperCollins launched the My First Little House program to introduce toddlers and young children to the world of Laura Ingalls Wilder. They began a search for an illustrator who had a similar style to that of the beloved illustrator, Garth Williams. My illustration agent, Merial Cornell, was showing art portfolios to the creative director at the time when he noticed my work. I was asked to do a sample piece to see if it was the right fit. It was, and two double-page spreads were requested. 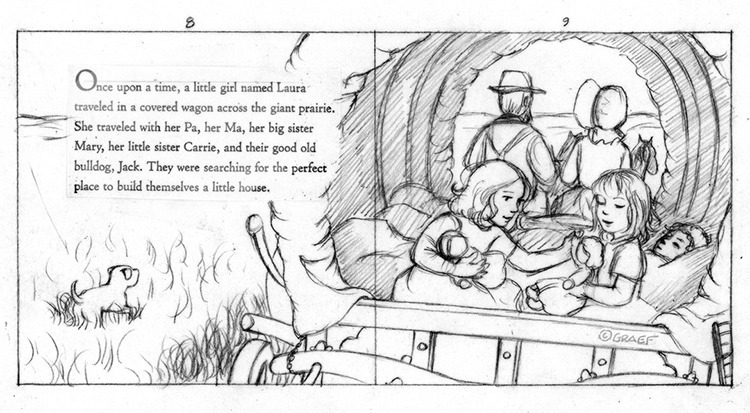 After these were approved, I was offered a contract for eight picture books based on Laura Ingalls Wilder’s writings. All of this was very exciting, as you can imagine! I lived in Milwaukee at the time and flew to New York to meet with the editors, art directors, and my agent to discuss the vision and details of the program. It was a wonderful experience to be a part of such an amazing creative team. Approximately one year later, after we had illustrated a couple of the picture books, HarperCollins approached us on expanding the program to include paper dolls, board books, baby books, chapter books and other items. I became a creative consultant/director for the next five years, art directing another 35 books. I went to New York for meetings every four months to brainstorm and discuss the particulars of the program. 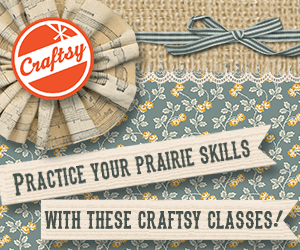 I worked with illustrators Doris Ettlinger, Jody Wheeler and Cathy Holly to create a cohesive look for the program. Doris worked extensively on picture books, chapter books, board books, covers and other items. Jody Wheeler worked primarily on the Farmer Boy picture books. Cathy Holly was instrumental in helping me at my Milwaukee studio. She cut friskets, airbrushed, sketched, cut boards and did many other duties. It was so much fun to work with other illustrators! During this time, I illustrated many of the books in the program and others for HarperCollins, including The Nutcracker and My Favorite Things. My two children were the primary models in My Favorite Things and my sister modeled as the mother in the book. My daughter, Maggie, would sometimes model as Laura for the Little House books. Friends and neighbors were the models for Santa Comes to Little House (out-of-print), the only one of the picture books that was painted in a more realistic style. I also illustrated The Martha Years novels, Little House in the Highlands, The Far Side of the Loch, Down to the Bonny Glen, and Beyond Heather Hills. 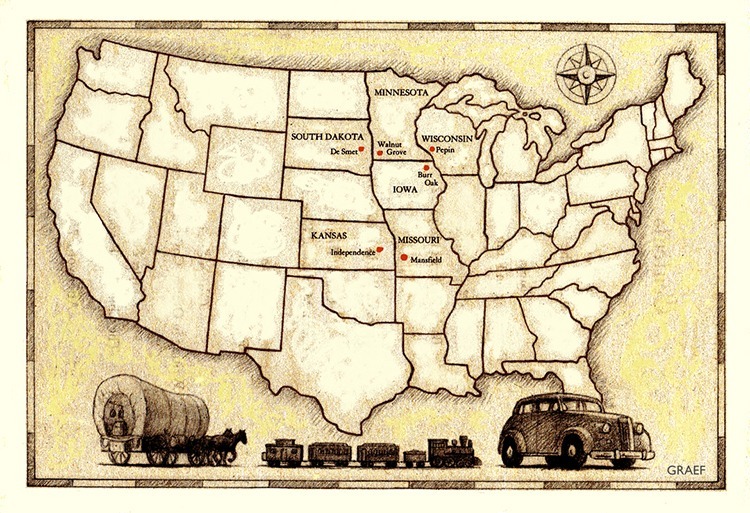 These novels were based on Laura Ingalls Wilder’s grandmother’s childhood in Scotland. Research was one of my favorite parts of the Little House experience. I have visited all of the Laura Ingalls Wilder locations and met so many people who were passionate about Laura and her life. 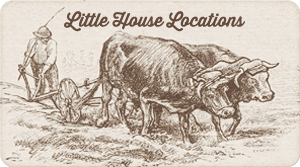 I traveled with my two young children (at the time) and my sister, to many of the Little House homesites. There is something magical about being in the exact place where Laura stood! We also stopped at all of the train museums along the way. Illustrating a Little House book starts with Laura’s words, of course. We all have images that come to mind while reading. My job is to capture those pictures to tell the story. 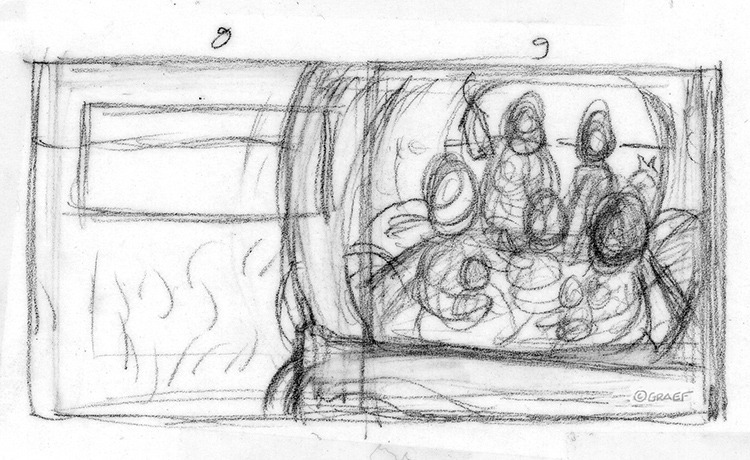 Small thumbnail sketches read like a storyboard for a movie. I try to make sure that images move back and forth between close-up and far away while keeping in mind the emotion of the words. 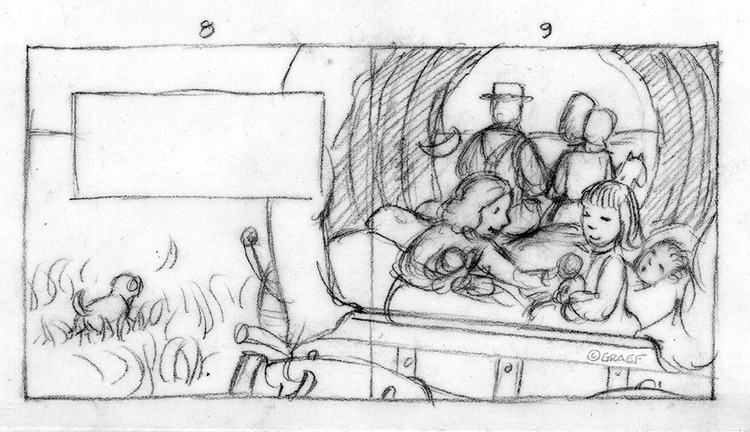 The thumbnail sketches are drawn on thick tracing paper called vellum. After the general design is scribbled, I place it under another piece of vellum to clean it up. 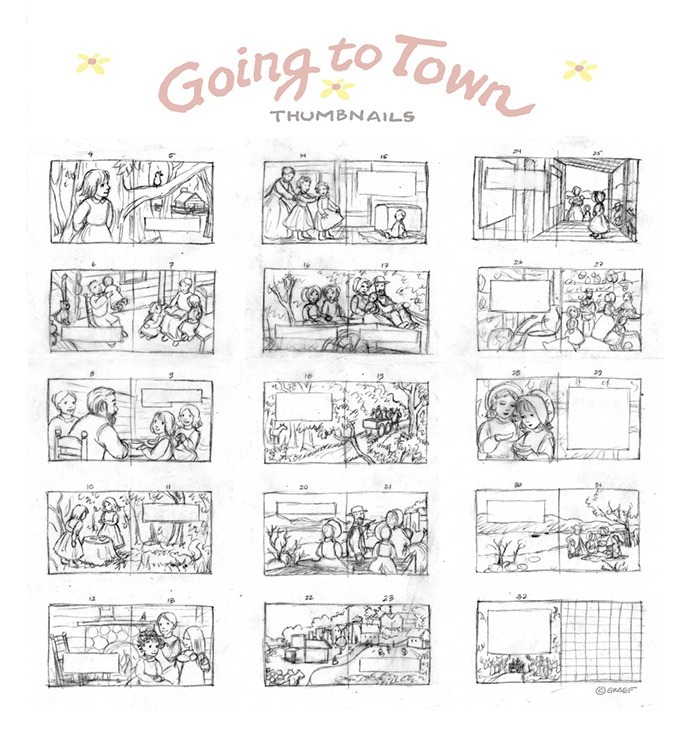 Here are all of the thumbnails for Going to Town. Thumbnail sketches by Renée Graef for the picture book, Going to Town. The editor looks at all of the thumbnail sketches for feedback. 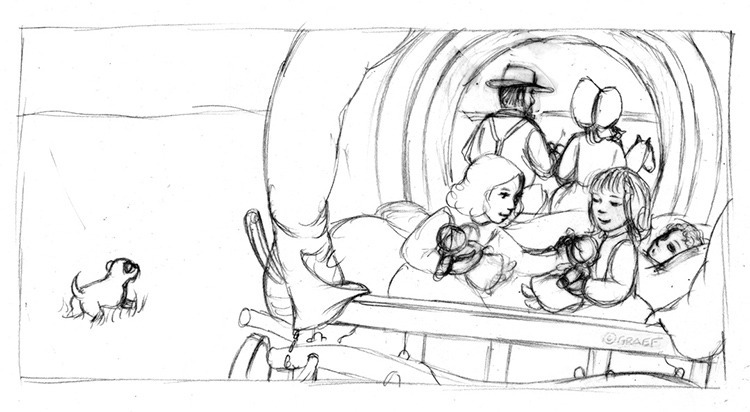 Here is the preliminary thumbnail for the wagon ride in the picture book, Prairie Day. 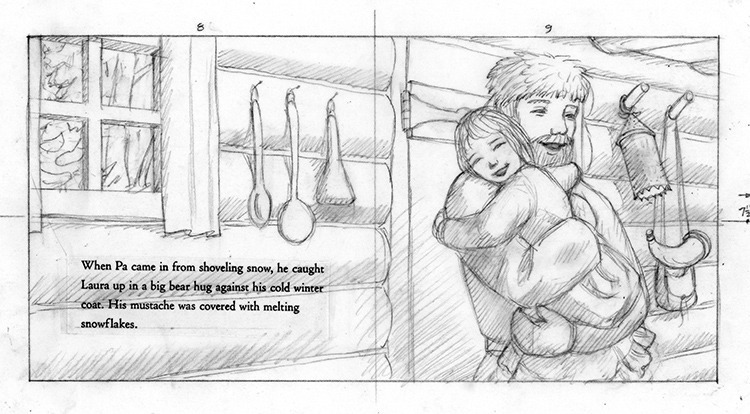 Preliminary thumbnail sketch by Renée Graef for the picture book, Prairie Day. And here’s the final thumbnail. Final thumbnail sketch by Renée Graef for the picture book, Prairie Day. Once the thumbnail is approved, I move on to a larger sketch. This is the point where most of the research is done and photos are taken for reference. Again, I will re-sketch a number of times to keep refining and adding more details to the sketch. Larger sketch by Renée Graef for the picture book, Prairie Day. Here is the final sketch that is sent to the editor for approval. Final larger sketch by Renée Graef for the picture book, Prairie Day. After sketch approval, the enlarged sketch is transferred onto coquille board with the use of a lightbox. I draw a line drawing using sepia and black colored pencils. The color is laid down using an airbrush. Colored pencil, watercolor, and gouache are used for detailing. This is the part that takes up the most time. And here is the final wagon ride illustration! 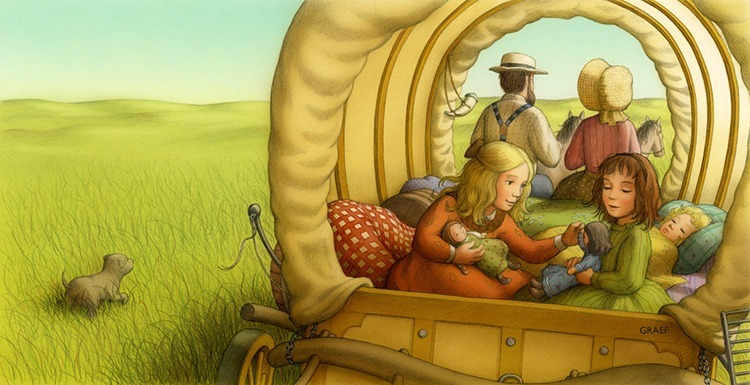 Final wagon ride illustration by Renée Graef for the picture book, Prairie Day. I will leave you with the sketches and final painting of Pa giving Laura a big bear hug from Christmas in the Big Woods. Sketch by Renée Graef for Christmas in the Big Woods. It has been so nice to revisit my Laura years with you! 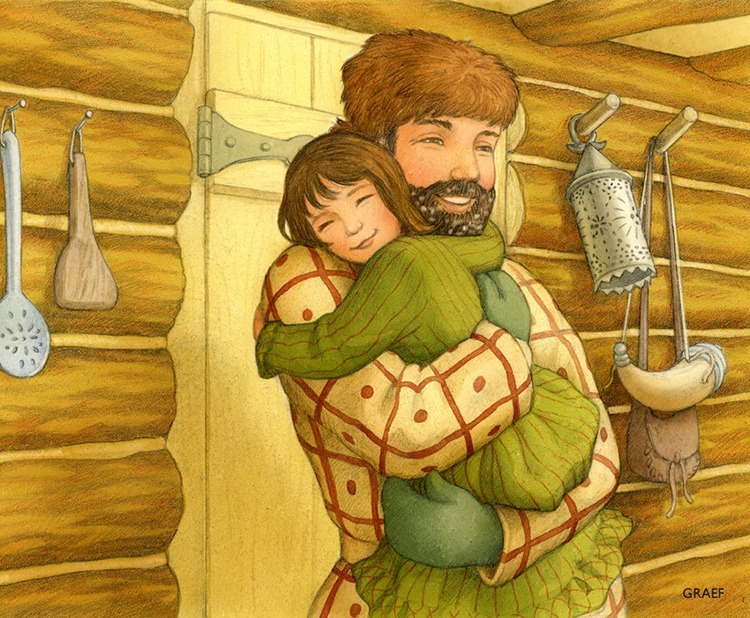 Final illustration by Renée Graef from Christmas in the Big Woods. 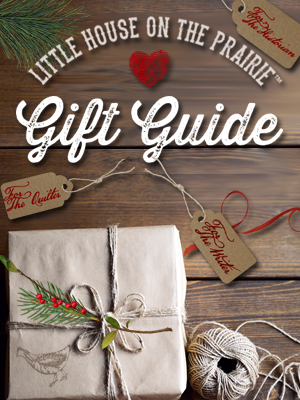 We think you will enjoy all of the Little House books that Renee Graef illustrated. These beautiful illustrations bring Laura’s stories to life for young children. For more great book selections, please see our recommended reading lists for children and adults. You may also be interested in Renée’s newest book, Thèrése Makes a Tapestry, published by Getty Publications. Do you have a story to share about what Laura and her stories have meant to you? Share them with us here and be sure to subscribe to our newsletter for future exclusive stories! 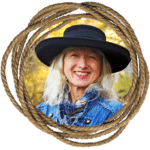 Renée Graef is an award-winning illustrator of over 80 books for children, including the Kirsten series in the American Girl collection and many of the My First Little House Books by Laura Ingalls Wilder. 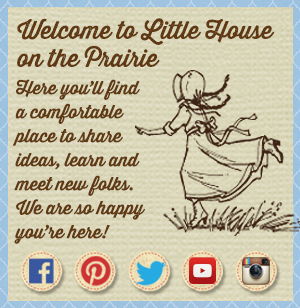 Renée worked as creative director for the Little House program at HarperCollins for five years and enjoyed traveling to the Laura Ingalls Wilder sites. Her most recent book, Thèrése Makes a Tapestry, is for the Getty Museum in Los Angeles. 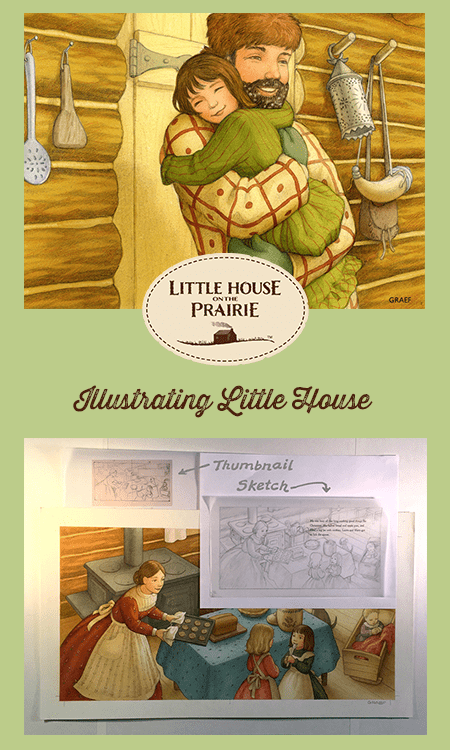 Your illustrations are so beautiful and truly capture the charm of the “Little House” books! My two year old daughter simply adores this series of picture books, they are her favorites! I cannot tell you how many times I have read them. : ) She will often want me to read the same story twice in one sitting. They are a treasure and joy to our family! Thank you for sharing your amazing talent! 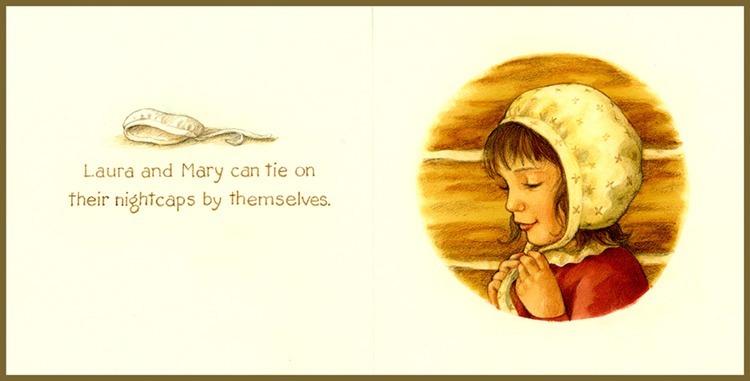 in the world of Laura Ingalls Wilder to illustrate her picture books. I can see in my mind’s eye the two of you sitting close while you read to her. A treasured moment indeed! Wow – your work is so warm!! I really enjoyed the sneak-peek into your creative process. As a web designer, I find it so refreshing to see hand drawn/sketched work. It just seems to be more “from the heart”. I really miss the pencil drawing I was able to do in my youth. You may have inspired me to return to drawing in my free time! Thanks again, Renee. Keep up the awesome work. Ms. Graef, Your books were our daughter’s first encounter with LHOP, which began at about age 3. She is now 11 years old and has long since read and reread Mrs. Wilder’s books countless times. I love that she has never given up your books, and she still pulls out the whole collection to read at least once a month. Your illustrations sparked a flame that have never waned in its brilliance. Many other books from early childhood have made way for new titles, but yours have found a forever home. 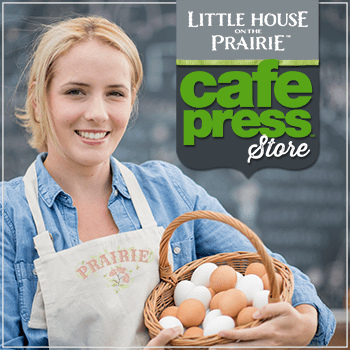 Thank you for demonstrating your step-by-step artwork on the Little House picture books. It’s inspiring for kids (and this “big” kid) to see the sketches, research and tools that are used to create the rich atmospheric pioneer world of Laura Ingalls Wilder’s stories. When these books first came out I was thrilled to share them in my school libraries with our youngest readers in Kindergarten and First Grade, connecting them to the original novels chapter by chapter….and still do so! 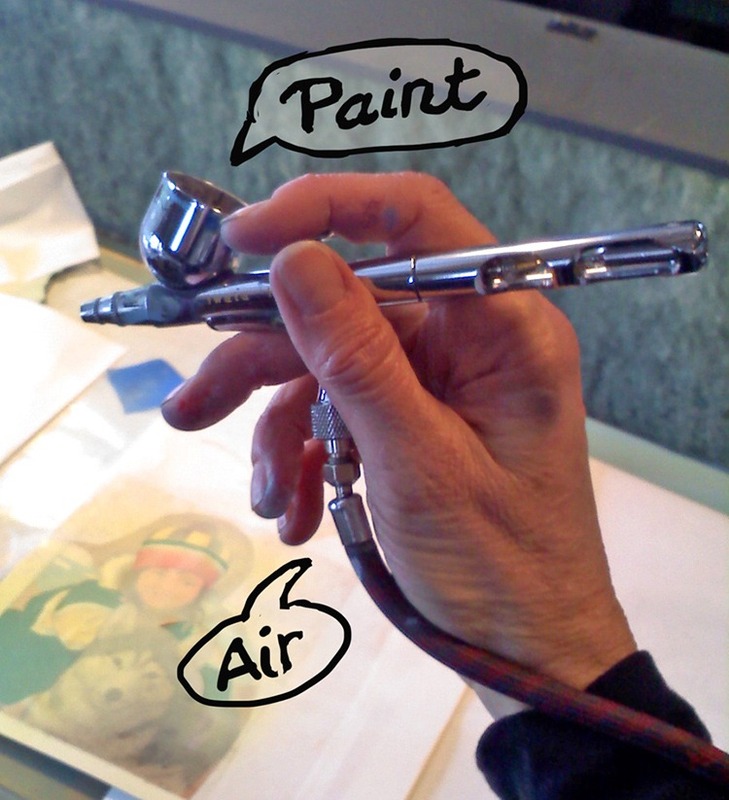 By the way, now I know what an airbrush art tool looks like! Thank you again for sharing your beautiful artwork in the “Little House” world. Dose the program still exist as a kid from the 90s i would love for my daughter to share that experience.